The belief that radiodating methods give absolute measurements of time is widespread as a result of scientific popularization in journals, conferences, and the media. In fact, due to the difficulties in applying the experimental method to events in the past, all chronometers based on natural or artificial nuclear disintegration need a calibration. This calibration supposes a great number of basic assumptions concerning initial conditions. The choice of these initial conditions affects the results. These assumptions are not demonstrated, only supposed to be true. 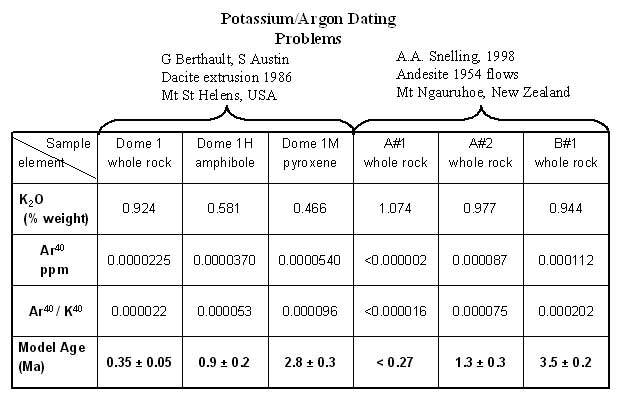 To give an example of the complexity of this problem, this paper presents a study of the most popular dating method, potassium/argon. The discussion of some phenomena taking place during rock crystallization reveals huge discrepancies between the model theory and the reality. Anomalous « K/Ar model ages » are frequently reported in the literature. This work explains these erroneous ages by « excess » argon (radiogenic and/or primeval) in volcanic rocks under study. This excess argon greatly alters the calculated age and puts into question the validity of the method. And as a consequence, the inability of the K/Ar method to give accurate results in palaeontology applications is a question of high importance. We conclude this paper with some suggestions for further investigations to check the validity of K/Ar chronometers. These investigations suppose complete coordination between different disciplines and laboratories. The experimental method applied to events in the past. 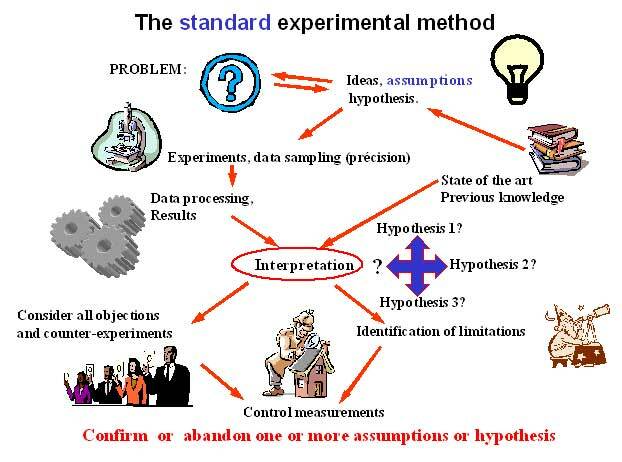 The experimental method can solve scientific questions and problems by using instruments, measurement procedures, and data treatment. The results, taking into account previous knowledge and discussion with other specialists, help to give an interpretation or build a theory. Experiments and measurements need to be accurate, explainable and reproducible. Figure 1 shows the complex intellectual process using previous knowledge and experiments to arrive at a conclusion or hypothesis. The most important point of the procedure consists in the discussion and confrontation with other possible explanations. Applied to presently observable phenomena, it is always possible for other scientists to reproduce the experiments. Application to events in the past is not possible in the same manner because we do not know the exact conditions of occurrence and we cannot reproduce them. We are obliged to use deductions and assumptions based exclusively on the effects of these past events presently observable. The knowledge of a past event is indirect and a complex combination of assumptions and contemporary experiments is required to test the credibility of supposed initial conditions. But we can only observe the contemporary consequence of the past event under study. Later events are able to modify and restructure the consequences of the prior event, figure 2, giving erroneous conclusions. What we can observe today is the result of a chain of causes spread over a period of time. These considerations show that multiple explanations of the causes and different hypothetical processes can co-exist for the same fact observed today. An honest discussion between scientists proposing different explanations is mandatory to guarantee a true scientific approach. But the attainment of certitude is not guaranteed. Fig. 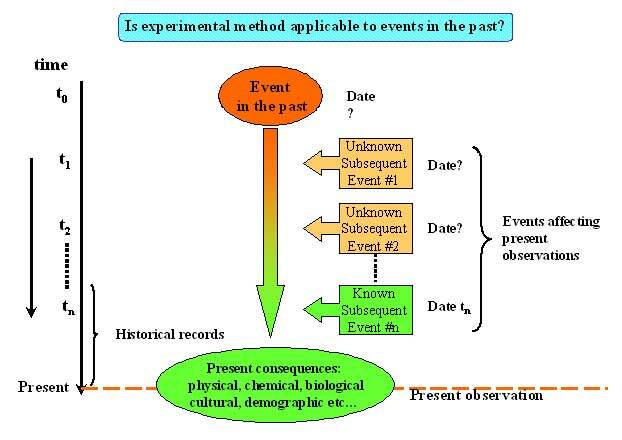 2 Is experimental method applicable to events in the past? Standard radiodating methods make certain assumptions and we propose to discuss their validity. The discoveries of natural and artificial radioactivity opened a large application field. In particular, dating past events was proposed in the early beginnings of the radio-active era (first quarter of the 20th century). But ignorance of exact radioactive series, ignorance of the existence of isotopes and the use of oversimplified atomic models gave very questionable results. Conditions affecting the sample in the past are identical to present conditions. The sample is a closed system, that is to say, there is no interaction (chemical, physical) with the environment. Only the parent radioactive element is present in the sample at the beginning. There are no daughter elements at that time. 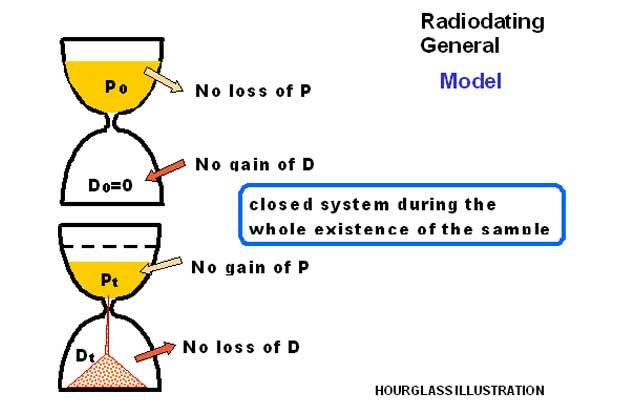 If we compare the radioactive rock with an hourglass, the conditions are summarized in Figure 3a and 3b, to illustrate the initial conditions chosen and the “closed system” concept. 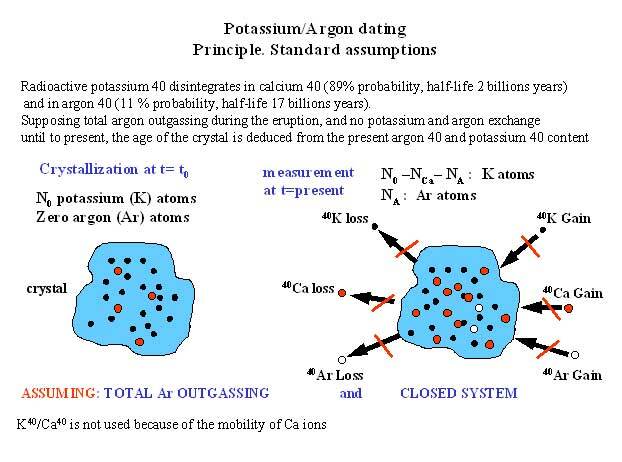 As an illustration, the next paragraph will focus on the very popular potassium/argon method (K40/Ar40). Fig. 3b Radiodating General Theory - Closed system during whole existence of the sample. This method, based on the accumulation of the radiogenic noble gas argon (Ar40) derived from potassium 40 (K40) decay, also depends on fundamental assumptions. It is absolutely necessary that the rock become totally outgassed from argon at the time of crystallization. That is to say, the radioactive clock must be reset to zero. If this condition is true, then a “model age” allows the calculation of a time function of argon40 and potassium40 present in the rock, and of the half-life of potassium40. Figure 4. The detection limit, function of the K40 content in the rock, ranges between 0.01 and 0.2 Ma (Ma = mega anni = million years). But, in addition, it is necessary to consider a “closed” system without any loss and/or gain of Ca40, K40 or Ar40. These requirements are essential to use the method as a chronometer and are summarized in figure 5. 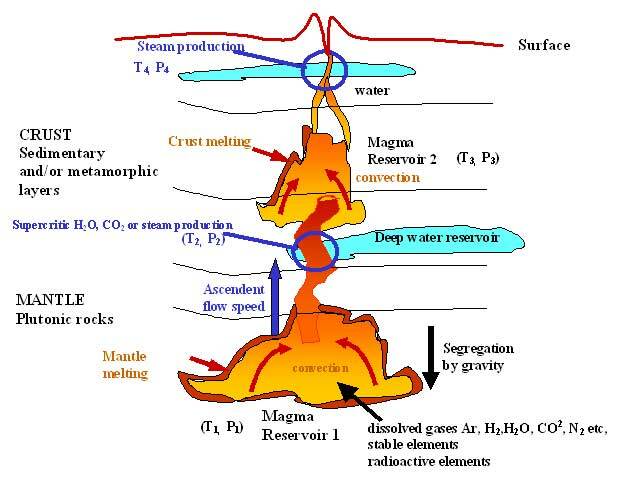 In fact, a magma reservoir is never a closed system as demonstrated by the measurement of young or contemporary rocks. A great number of papers report anomalous old ages for present or historical lavas collected everywhere on earth , , but this effect was considered exceptional by most authors. But in reality, it is the rule. Fig. 6 Potassium/Argon Dating. Results on dacite collected in 1986 at the extrusion dome of Mt St Helens (Washington, USA) from 1980-1985 eruptions. Similar results are obtained from andesite flows originated at Mt Ngauruhoe (New Zealand) in 1954. Data are presented on a table on figure 7. The dates range between 0.27 Ma and 3.5 Ma for the same andesite. Fig. 7 Potassium/Argon Dating. Results obtained from andesite flows originated at Mt Ngauruhoe (New Zealand) in 1954. The explanation is obvious: the measured argon 40 in these contemporary rocks is not the result of radioactive decay of potassium 40 (no time to accumulate Ar40 from K40 decay). Excess argon is present in the crystals in various amounts depending on very complex geochemistry taking place in magma reservoirs located in the earth’s crust and/or the mantle (see next paragraph). 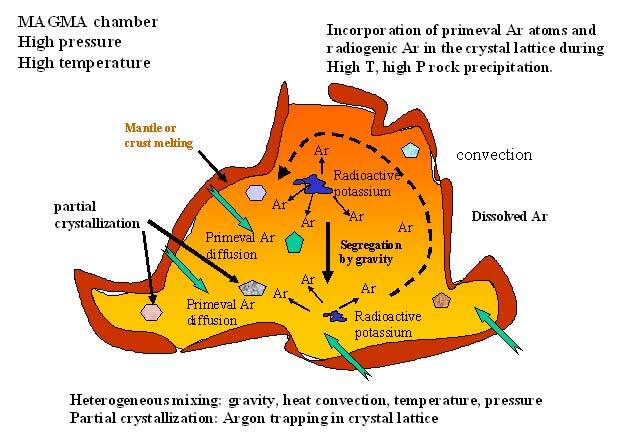 Ar(total)=Ar(primeval)+Ar (radiogenic in the magma)+Ar (radiogenic after solidification) +Ar (inherited from atmosphere during eruption or diffusion after eruption). The standard assumption of complete outgassing needs the first two terms to be zero. The argon inherited can be corrected by measurement of the ratio Ar40/Ar36. 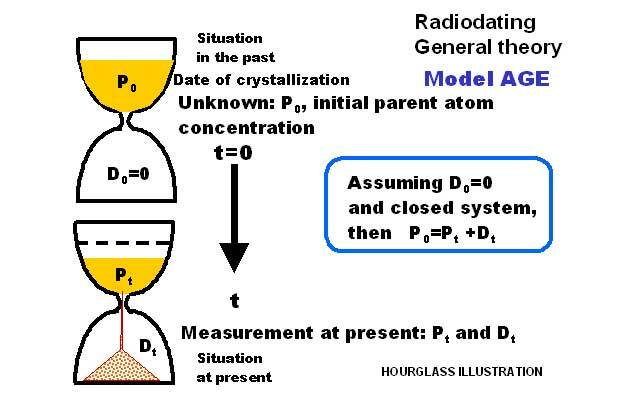 The only term acting as a chronometer is Ar(radiogenic after solidification). with t = the age, ln = the neperian logarithm, a= year unit. Art = the number of Ar40 atoms present in the rock today. Kt = the number of K40 atoms in the rock presently. In the model used, Ar0 is assumed equal to zero, that is to say, no argon 40 is present when the rock formed during the eruption. The argon 40 measured in contemporary lavas must be equal to zero (or under the detection limits of the method) to insure that the “radiochronometer” is reset to zero, that is to say that all the undesirable argon was outgassed during the volcano eruption. But the fact that we measure excess argon trapped in the crystals of contemporary lavas whereas the K decay was not initiated, is the proof that this condition is not realized. Argon is present in the rock at the moment of the eruption and implies that Art is not equal to Ar (radiogenic after solidification) but to Ar(total). The extreme complexity of magma geochemistry can explain why this “excess Ar” is present, as explained in the next paragraph. Although our knowledge of the crust and mantle is indirect there is an urgent need for geochemists to take into account the consequences of open-system magma bodies in the formation of the earth’s rocks , . Multitudinous more or less complicated models have been proposed in recent years (bibliography in ) and sophisticated diamond-anvil cells are used in the laboratory in an attempt to reproduce crust, mantel and core conditions (up to 200 GPa and 4000°K) . Figure 8 gives a partial overview of possible physical-chemical processes in magma reservoirs. Huge temperature and pressure in the magmas explain the melting of sedimentary or metamorphic layers composing the walls of the reservoir. A lot of elements can be incorporated in the magma and can change the isotopic and chemical composition. Primeval argon trapped in the magmatic, metamorphic or plutonic surrounding rocks, radiogenic argon produced in these rocks by disintegration of K40 are incorporated in the magma. Fig. 8 Partial overview of possible physical-chemical processes in magma reservoirs. The encounter of water during plasma ascension changes the hydrothermal conditions. Most of molecules (H2O, CO2, etc…) are in a supercritical state, imposing drastic changes in the solubility of other elements and noble gases in the magmas. These hydrothermal conditions are very different from the normal ones at the surface of the earth. Figure 9 shows an enlargement of figure 8, giving more details in the reservoir. The magma tends to be homogeneous by heat convection, but segregation by gravity, supply by surrounding walls and replenishment by others reservoirs tends to scatter the composition and to give heterogeneous mixtures. Fig. 9 More detailed view of the magma reservoir. The argon present in the magma, whatever its origin, can be dissolved in the liquid but also trapped in crystals formed by fractional crystallization and can co-exist with the liquid melt. High pressure high temperature anvil-diamond measurements show that actually fractional crystallization occurs in silicate rich melts. These crystals do not dissolve again during eruptions and maintain gases trapped in their lattice and/or crystal defects, in particular argon, the atomic radius of which is small (0.19 nm). The amount of Ar trapped in the lattice depends on the crystal structure as showed previously in figure 6 and figure 7. For the Mt St Helens dacite whole rock, pyroxene inclusions trap more argon than amphibole inclusions, giving a much older age, 2.8 Ma, compared to 0.9 Ma. It is important to stress the fact that we are measuring contemporaneous samples. Olivine lattice is considered by geophysicists as a one of the best argon traps, avoiding radiogenic Ar gas escaping in the time interval “rock formation/measurement.” But in terms of initial excess Ar, olivine gives the higher miscalculations because a greater quantity of argon remains in the lattice. 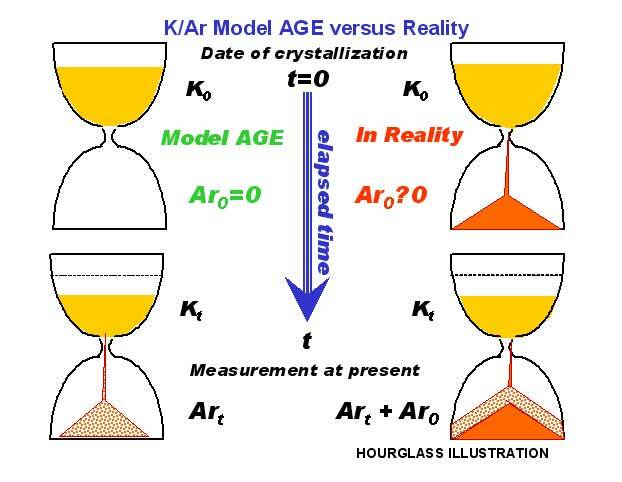 The actual situation is summarized in figure 10, which compares the theory with the reality, using the hourglass analogy. Fig. 10 Comparing the theory with the reality, using the hourglass analogy. Contrary to radiogenic argon originating in K40 decay, excess argon is not related to the amount of K40 present in the rock, and the model age fails in a great proportion as the ratio Ar40/K40 increases due to the decrease of K40 contained in the rock under measurement. In practice, presumed old lavas are probably much younger than expected, due to the presence of excess argon. The values of this excess Ar are in the range of the values measured in contemporary lavas (St Helens and Mt Ngauruhoe). To give an example, consider that 0.0001 ppm excess Ar gives 3 Ma apparent age in a contemporary rock containing 0.5 ppm K, and 17 Ma in a contemporary rock with 0.1 ppm K.
The more sophisticated method Ar40/Ar39 using thermal neutron activation of K, in order to measure its amount, suffers from the same limitations, because of the need of neutron monitor samples of supposed known age (obtained by the standard K/Ar method). In theory, dating fossils with the K40/Ar40 method, is only possible if they are buried above or under a solidified lava flow. In reality, fossil deposits are far away from magmatic flows. The stratigraphic scale is used to match the depth of fossil occurrence with the depth of lavas flows located several miles away. The lavas flows are dated by radiometric Ar and an age is given to their strata depth. In fact the radiometric results are calibrated with the stratigraphic scale. The excess argon demonstrated in contemporary deposits also alters the results on supposed old rocks and prevents any consistent age to be attributed to the fossils. In addition, the necessity to match with the standard stratigraphic scale destroys the credibility of the entire process. 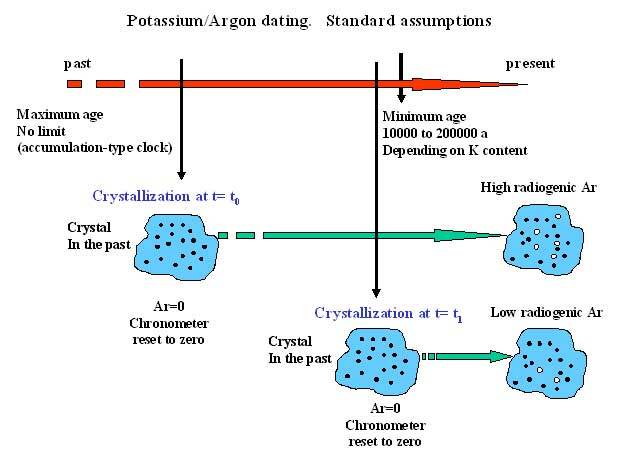 Obviously, the assumptions at the base of K/Ar radiodating method are not verified in practice. It is impossible to consider a rock or a magma reservoir as a “closed systems.” The absence of daughter elements at the start of a disintegration series is no more tenable. Recent research  shows strong changes in radioactivity decay in precise metal environments (the inner core earth is supposedly formed by iron). This discovery can have profound consequences for radiodating procedures and must be developed. It is also extremely relevant to the study of atomic waste management. To answer some problems, we propose to investigate the fascinating poly-strata fossils, in particular, petrified tree trunks. Figure 11 represents a proposition of comparison of data collected from the trunk at various depths and from the sedimentary layers on the vicinity. A method compatible with sediments and petrified wood must be used. The existence of such trunks vertically embedded in horizontal stratae is reported in many locations. To complete the test, in samples containing carbon, it would be interesting to use a dating procedure with cosmogenic C14, even if the samples are considered older than 50 ka (ka=thousand years). This procedure was tested with success on fossilized dinosaur bones. Fig. 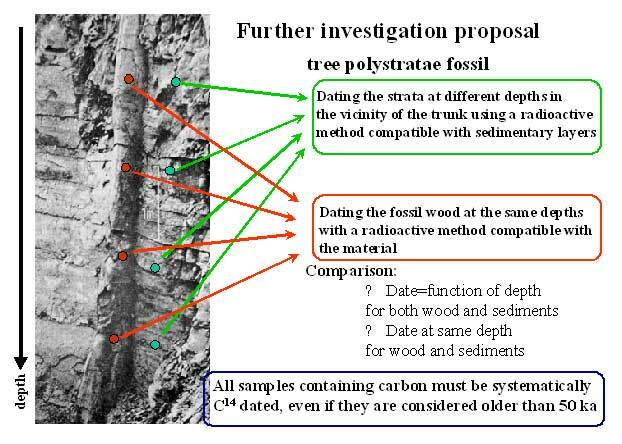 11 Investigation proposal for poly-strata fossils. In the particular case of K/Ar method, the presence of excess Ar and the impossibility of correcting the bias introduced, put into question the entire “model ages” results obtained during the last decades in dating fossils. 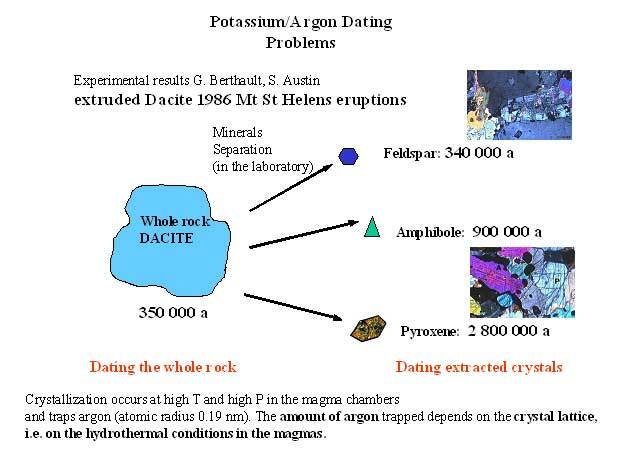 These considerations on radiodating limitations are important at the present time when alternative theories are being proposed by G. Berthault to reconstruct the stratigraphic scale in the light of experimental research,. A correlation between the two approaches will be an interesting project for researchers in the next decade. G. Berthault Quelle méthode pour la datation des australopithèques? “Le CEP” n°20, 3e trimestre (2002). K. Scripko Erreurs de datation K/Ar dues à l’enrichissement des roches volcaniques en composants volatils “Le CEP” n°20, 3e trimestre (2002). C. Rolfs Electron screening in metallic environments: a plasma of the poor man. Publication della Societa Astronomica Italiana, v.77, p.907 (2006). G. Berthault Analysis of the Main Principles of Stratigraphy on the Basis of Experimental Data J. of Russian Academy of Science “Lithology and Mineral Resources”, vol.37. n°5, 2002, pp 442 - 446.